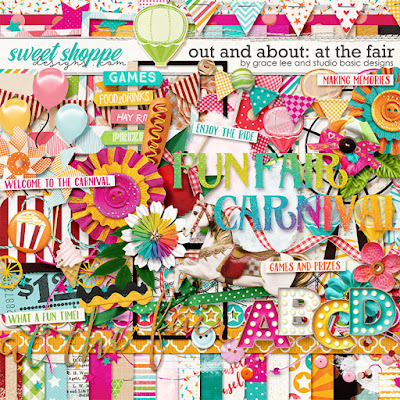 Out and About: At the Fair with Studio Basic Designs is the next in their collection of 'get-out-and-explore' themed kits! Color, fun and excitement fill this exuberant kit! Full of carnival character and energy, you'll be unable to resist the enthusiastic invitation from this kit to create at least a page or two dedicated to your family's experiences at the fun fair or county show...including all of those irresistibly naughty treats, rides, games, and prizes! With an irresistibly happy vibe, and a fabulous marquee style alpha in 4 bright colors, you'll love playing with this kit for all sorts of fun, party occasion! and 81 fun filled elements. The elements included are: a candy apple, 4 Ferris balloons, 4 banners/bunting, 2 bows, 4 buttons, 2 cotton candy, a corndog, a Ferris wheel, 7 flowers, 3 leaves, 3 frames, a carousel horse, a pinwheel rod/stick, 6 pinwheels/windmills, 3 ribbons, 2 scatters, 2 pieces of string, a trim, an arrow, 3 balloons, 2 yummy mixed media brushes (each in 2 versions), some candy, a flair, a piece of foliage, a food car/cart, a multi aperture frame, an ice cream, 2 labels, a paper piece, some ricrac, a rollercoaster stamp, a sign (2 variations), lots of stars, some stitching, a tag, a ticket plus title and word art.